My VMV Hypoallergenics frenzy started out with the Illuminants Brilliant Finish (SPF) 25 Powder Foundation, which I have been using since I bought it. This led to a subsequent massive haul on Black Friday. Heh. You can click here and here to learn more about the brand, the products I bought, my gushing and be, well, tempted! Hehe. Anyway, back to my Christmas gift! 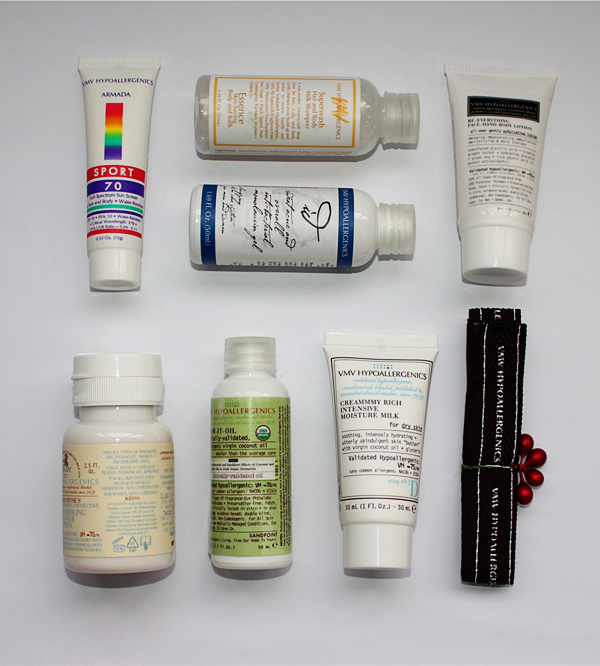 My VMVery Favorite Things ($50) is one of the 4 holiday kits VMV Hypoallergenics has prepared for us! This kit contains 7 of the brand's all-time favourite products, perfect for VMV Hypoallergenics junkies, like me. Heh. These products will pamper us from head to toe, and keep our skin in tip-top condition! This is an all-over gentle exfoliating lotion. With a concoction of unbuffered glycolic acid, kinetin growth factor, hydrating glycerin, green tea, rice phytic acid (Made up of 3 potent antioxidants. ), this lotion is going to renew, regenerate, rebuild, revitalize... Re-everything! It provides gentle microdermabrasion, by renewing and regenerating our skin cells. At the same time, it also keeps lines and wrinkles at bay! Expect a 'post-peel glow' with smoother and firmer skin! A creammmy, extra-rich, lubricating skin 'milk'. This skindulgent 'butter' is a bit of a whizz-kid. It soothes and hydrates more intensively where your skin needs it the most, with virgin coconut oil and glycerin. It also contains coconut-derived monolaurin, which is a gentle and natural antibacterial. Hello A grade! This 'mirac-oil' is an incomparable moisturizer with fatty acids native to skin. A 'skinside-out' essential. This bottle contains 100% organic virgin coconut oil. Cold-1st-pressed, USDA-certified organic, this pure coconut oil is rich with fatty acids that are native to our skin. It helps replace lost lipids, repair damage, improve oil wall saturation and reduce inflammation. I apply just a little of this on my face after showers and under my moisturizer and makeup. It sinks into my skin quickly and easily, leaving no greasy after-feeling, and helps keep my skin moisturized. My skin has been pretty dry lately due to a bad encounter but is on its way to a pretty speedy recovery. One tip, when dealing with facial oils, is to really massage the oil into your skin and not let it sit on your skin! A wait-in-line-for-it favourite for its skincredibly lightweight feel + powerful protection even in extreme outdoor conditions. 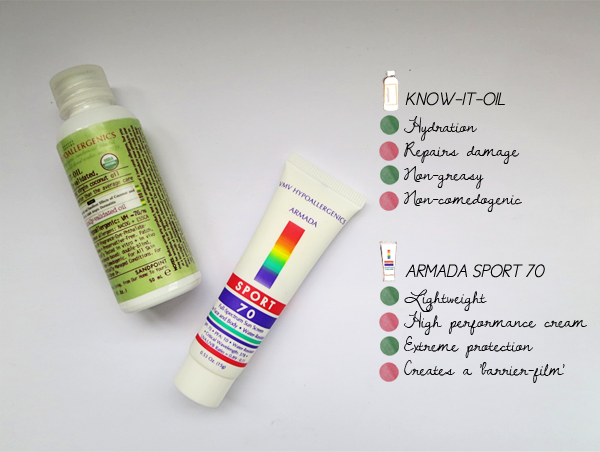 This lightweight, full-spectrum sun screen can be used both on the face and body and is water resistant. It has clinically proven PFAs and SPFs as high as 70-90. Creating a 'barrier-film', which acts like a second skin, it screens out UVA and UVB rays, providing protection against skin cancer, photoaging and hyperpigmentation. A sublimely nourishing head-to-toe favourite of babes of all ages. This lotion is filled with USDA-certified organic virgin coconut oil goodness. It is a rich source of fatty acids, that are native to our skin. 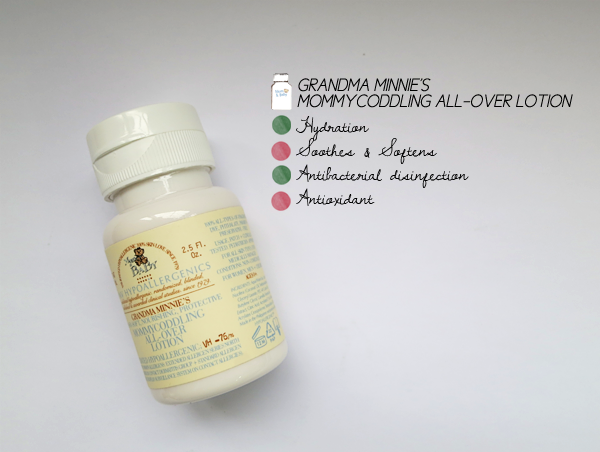 It also contains coconut-derived monolaurin, provides a painless, gentle-yet-potent antibacterial disinfection. This is perfect for our little ones and for moms-to-be! I started using it a few nights ago and I find it very lightweight and moisturizing. It seems to provide just the right amount of moisture that my skin needs. There is no greasy after-feeling and my skin feels very comfortable. One thing though, I don't quite appreciate the packaging. The bottle is pretty hard, so you can't squeeze it to get the lotion out. At the same time, it is also difficult to shake/ pour the lotion out of the bottle. The full-sized bottle comes with a pump so that will make dispensing a lot easier! Our multi-tasking maestro. Keeps skin cool, fresh + matte. Manages face + body bumps. Great as a hand gel, too! One of VMV Hypoallergenics' many star products, this mattifies and kills acne AND sweat acne. It contains the coconut-derived monoglyceride that provides anti-bacterial, anti-viral, anti-fungal, and anti-protozoal treatment. As mentioned in my earlier entry, this product caught my eye (And stole my heart.) because it addresses acne caused by sweat fungus. A unique gentle, non-drying bath experience. Over 20 years of popularity. This creamy-soft and gentle shampoo cleans our scalp, hair and body. It has an anti-residue formula that cleans without clogging pores and helps to calm acne and rashes. If you have been reading my blog, you may have noticed that I don't splurge on body washes because I think a simple one suffices and that all body washes are really the same. You may also know that I have eczema on my back and in the valley of my right arm. After showers, these areas usually itch until I apply creams on them. When I used this wash for the first time, I noticed that my afflicted areas didn't itch a tiny bit and I didn't need to apply any creams. I don't think this will eradicate eczema completely but it helps make things more bearable. VMV Hypoallergenics has also prepared a kit for the leading men in our lives. I got the For All Ye Merry Gentlemen ($38) for the brother! He is at that age when acne is your best friendfiend so I'm really hoping that the Red Better Spot Corrector works for him! 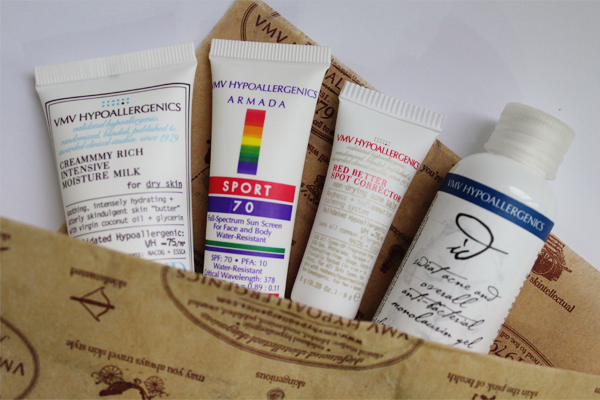 The other 2 kits that VMV Hypoallergenics have prepared are the Creams de la Crème (2nd from the left) and the Mistle-Glow (4th from the left). 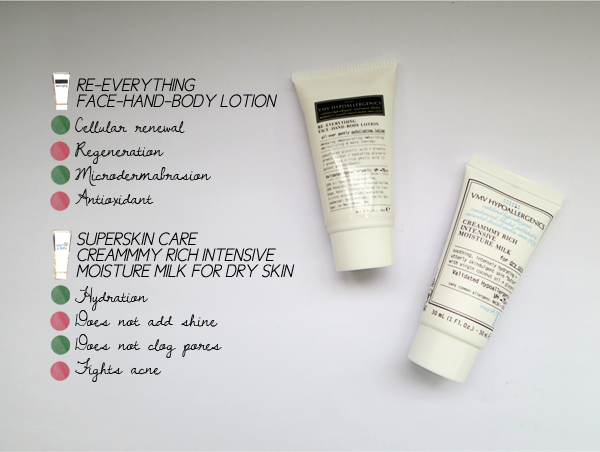 Contains Re-Everything Face-Hand-Body Lotion, Creammmy-Rich Intensive Moisture Milk and Essence Skin-Saving Hand + Body Smoother. This is a collection of VMV Hypoallergenics' mmmost popular mmmoisturizers, that are jam-packed with rich and lasting moisturizing protection! This will definitely served us well, especially when we enveloped in cold artificial air everywhere we go! Contains Skintelligent Beauty Glitz Lipstick and Ooh-La-Lash! Volumizing Mascara. This kit is perfect for the makeup lovers! It provides the tools to open your peepers and keep your lips moisturized and glitzy enough for both casual outings and parties! Good things have been said about the duo online, especially the mascara, so do check this kit out! Whoa! This has been a mighty long entry but I do hope it has been helpful (And enjoyable.)! 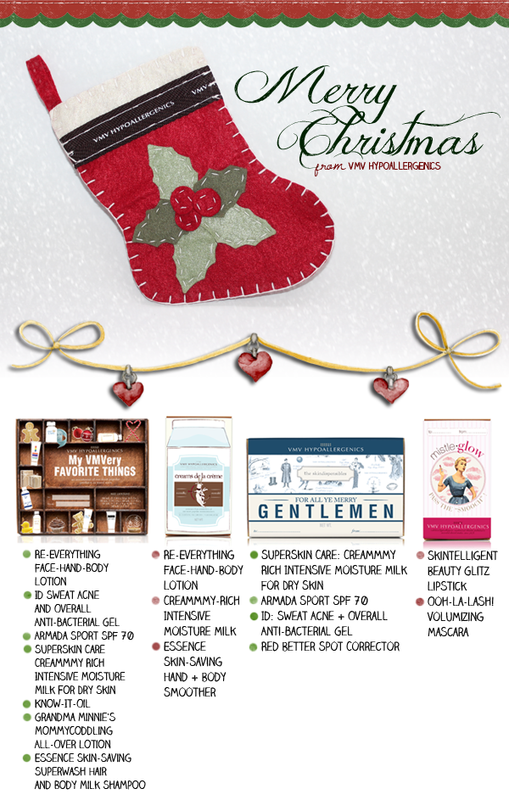 VMV Hypoallergenics is also giving you a hand-stitched felt stocking ornament with every purchase of a holiday kit. (: If you have an questions, feel free to leave a comment or drop me an email. In the meantime, you can check out VMV Hypoallergenics on Facebook here or visit the store in ION Orchard, #B3-48. (: Till then, as VMV Hypoallergenics would say, Happy Holi'dews'!